Enjoy Rome like a local with a scooter tour. Following a guide, ride through the Eternal City on a scooter to see top attractions like the Colosseum, Trevi Fountain, Piazza Navona, Castel Sant’Angelo, St Peter’s Basilica and much more. 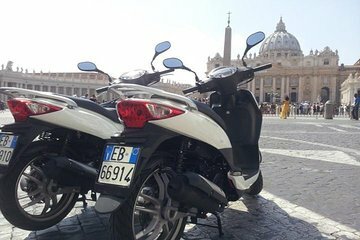 A fun and memorable alternative to conventional tours, a scooter adventure allows you to enjoy the fresh air and catch all the views of beautiful Rome.